Wendy Freden was diagnosed with stage 1A multifocal invasive breast cancer when she was 44, after feeling a lump in her breast. Now, at 45, she’s cancer free, but getting there took a lot of difficult decisions. In a post to the Love What Matters Facebook page, Freden wrote her story, from diagnosis to remission, including her decision to get a double mastectomy, as reported by Refinery29. For many diagnosed with breast cancer, the decision of whether or not to have a mastectomy can be difficult and emotional. But, as Freden recounts it, the decision was easy. “For some women, this is an emotional decision, but I had no difficulty requesting a double mastectomy,” she wrote. “I never wanted to hear ‘you have breast cancer’ again. Three weeks after diagnosis, I had a double mastectomy. 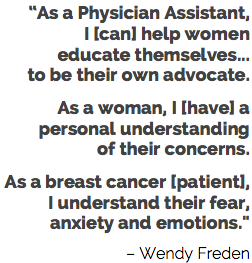 Read more of Wendy Freden’s story at this link. For even more assistance, check out this mastectomy video library providing more answers to questions about diagnosis, treatment and what to expect, maintained by breast cancer expert Dr. Jay Harness at BreastCancerAnswers.com for your use. This entry was posted in Breast Cancer Surgery, Chemotherapy, Doctor-Patient Relationship, Information Strength, Patients Speak, We Live You®: The Latest and tagged bilateral mastectomy, double mastectomy, prophylactic mastectomy. Bookmark the permalink.